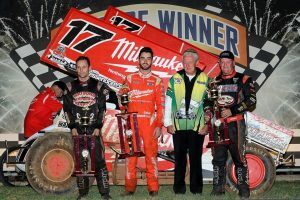 It’s McFadden, Monte and Milwaukee’s night at Valvoline Raceway | Talking Speedway, Speedway news from around the world! 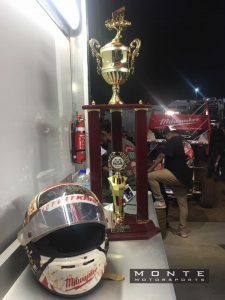 The spanking recent form of James McFadden and his Monte Motorsports backed Milwaukee Tools W17 continues with a powerful win on night two of the 55th Australian Sprintcar Championship at Sydney’s Valvoline Raceway. The Team has brought their Classic winning form up the highway and onto the clay at Valvoline Raceway. Starting on the front row after impressive heat form the W17 never looked backed from his front row starting position. Never headed throughout the 30 lap journey and never seriously challenged he crossed ahead a late arriving Ian Madsen who was fortunate to take advantage of a Robbie Farr cushion banging exercise and slip through for second. Robbie Farr finished in third. The stage is now set for a thrilling Championship night .The road to the Title still has a long way to go and the chance have your name engraved on the Championship Trophy for 55th time will be all the motivation required. Kerry Madsen leads the points 104 into the Championship night by 1 point from James McFadden, then Farr and Brazier on 101, Tatnell and Ian Madsen 97, Veal 96, McHugh and Delamont on 95 and Ferguson on 94. This is one race you can’t afford to miss, who will be the 55th Australian Sprintcar Champion ?